I was trying to get creative with this shot when Buddy jumped up and I decided to do a combination cat/shoe shot instead. Any shot is better with a cat in it. I ended up getting a fresh pair of the exact same red sneakers, because I love them, and they are so comfortable. Except I ordered red shoe laces, because those mustardy ones that come with them are actually kind of drab as you can see (I also don’t love the gold stripe, but what are you going to do, nothing’s perfect). 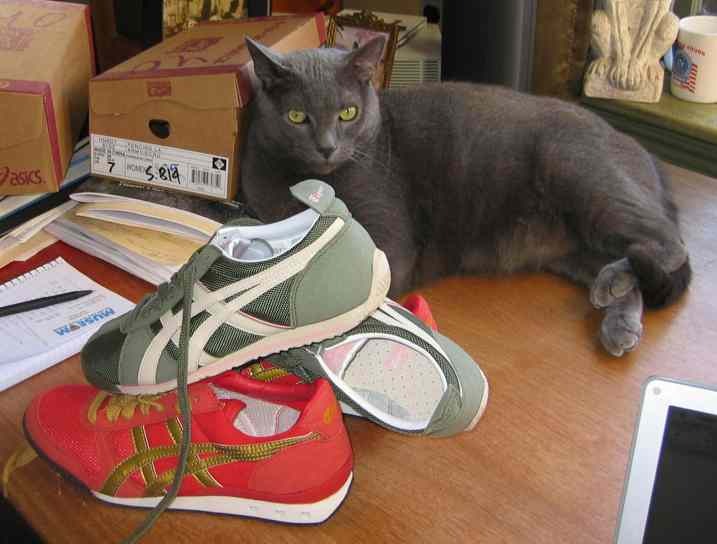 I got a pair of green sneakers from the same manufacturer, Onitsuka. The green is better than what is coming out in the picture, and I also don’t like the white stripe, and what is with Onitsuka and the poor stripe color choices? ?